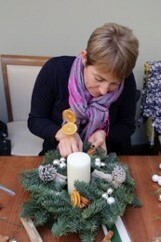 Squire’s Garden Centres are running a Christmas masterclasses, where you can create a traditional wreath for your front door, or a candle centrepiece for your dining table. Using a fresh Noble Fir ring as the perfect base, you’ll get to decorate it with pinecones, petite baubles, snow spay and dried flowers (decorations vary by centre), plus you can even bring foliage from your own garden if you wish. Personalise your home this Christmas by creating your own unique design to wow your friends and family. The Christmas masterclass runs on 30th November 2017, 5th, 6th and 8th December 2017 at selected Squire’s Garden Centres. There are sessions at 10am, 2pm or 6pm (selected dates) each lasting around an hour. Tickets are £25 per person and you’ll get tuition from Squire’s gardening experts, all materials to make your wreath or candle centrepiece, a voucher for tea or coffee and cake in the Café Bar, plus 10% off any plants purchased that day. Advanced booking is essential, either in person at Squire’s or call your nearest centre (excludes Woking).